Get your ears and your eyes revved up with this great-sounding micro component system featuring Yamaha Motor-inspired colors and design accents. 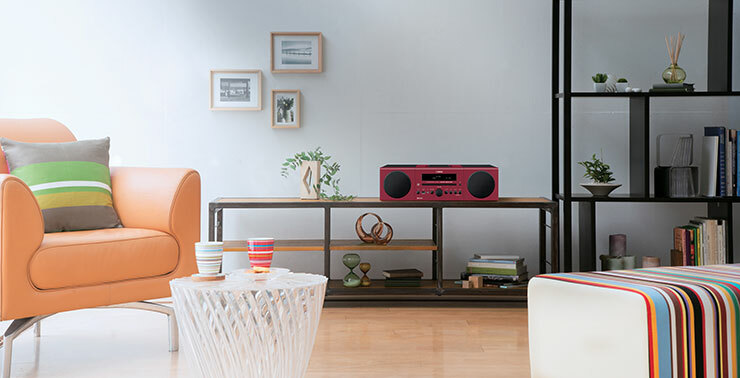 Exceptionally versatile, the MCR-B043 supports CDs, AM/FM radio, USB sources and Bluetooth® connectivity that lets you wirelessly stream music from your iPhone®, iPad® and Android™ devices. 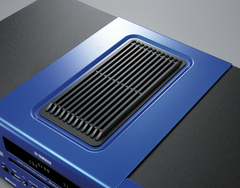 The MCR-B043 includes Yamaha's Music Enhancer, which restores lost audio data from compressed music files. 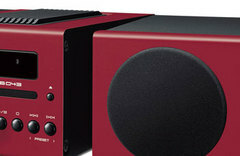 The result is dynamic sound with better range and presence. Each speaker features a 4-1/2" driver that uses a large-diameter magnet to deliver rich bass, clear mid-range and sparkling highs. From the top panel ornamentation recalling a radiator to the volume knob echoing the design of a reservoir cap, the inspiration behind Yamaha motorcycles shines through. The racing blue, red, black and white color options, combined with a sleek and stylish design, reflect the beauty of Yamaha motorcycles. Enjoy wireless playback from your smartphone, tablet or PC effortlessly with Bluetooth wireless technology. In addition to the CD player, USB and FM/AM radio, it has an AUX-In terminal for connecting a PC or digital audio player, giving you music enjoyment from a variety of sources in one unit. An on-board USB port allows you to charge your smartphone or tablet. 5-1/8" x 4" x 9-7/8"